As yet another year filled with fabulous eats draws to a close, restaurants have shifted their focus to setting up for success in 2018. With more and more restaurants throwing their hat in the ring to battle for market share, developing a rock solid restaurant marketing plan is key to staying in the fight. In this post, we’ll focus on real examples of restaurants successfully staying ahead of the pack with their marketing tactics. We’ve also included a free restaurant marketing plan to help you organize your thoughts, and develop a plan of attack for 2018. The amount of restaurants using social media ads in 2017 increased by 20 percent from previous years. All restaurants – from international franchises to single-location shops – engage in and benefit from social media ads. 2018 is the year to seriously consider paid social ads if you haven’t already. Why? Because organic social media posts only reach about four percent of your fan base. If you want to see return on time invested in social media, you’ll have to invest some money, too. Below is an example of social media ads done right. 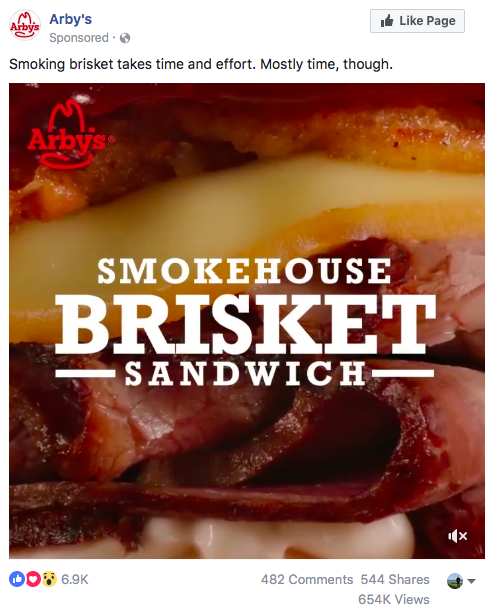 Nationwide restaurant chain Arby’s advertises their smokehouse brisket sandwich in a simple, 15-second video. The post has been reacted to, shared, commented on, and viewed hundreds of thousands of times. Don’t have the budget or digital marketing prowess of Arby’s? Not to worry. 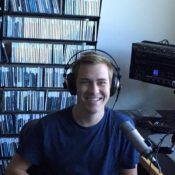 Facebook has a page dedicated to helping your restaurant’s Facebook business page get started with ads, including how to make an ad, how to choose an audience, and how to select a budget. Start making noise with your social media posts – a little bit of ad spend can go a long way on the Internet. Google is there to help us answer deep burning questions, like where to eat tonight or who won Best Picture in 1992 (it was The Silence of the Lambs, by the way). Google sees 3.5 billion searches per day, and you better believe your potential patrons are searching phrases like “food near me” and “local restaurants.” Filling out your restaurant’s Google My Business page and, when appropriate, paying for placement helps your restaurant be front and center when people search for nearby dining options. 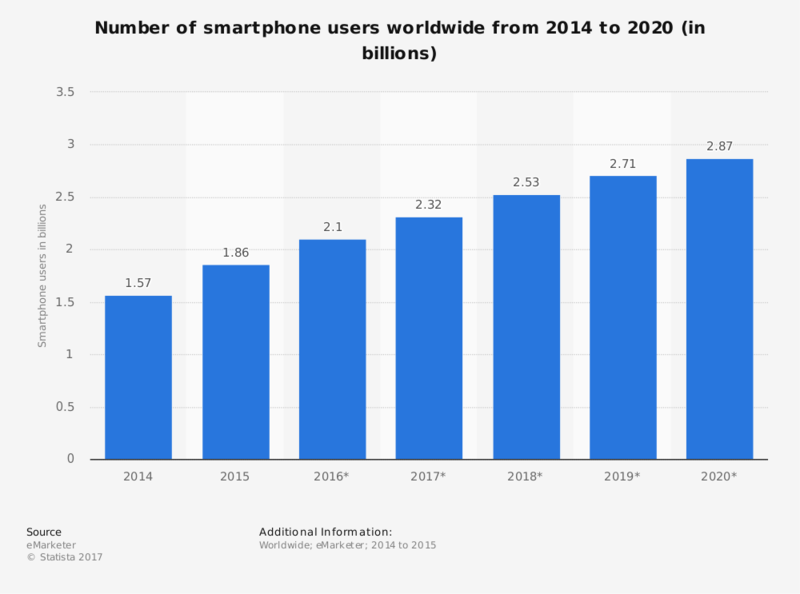 According to Statista, worldwide smartphone usage is only on the rise. This means the number of people searching for restaurants on the go will only continue to grow. Ensuring your restaurant Google My Business listing is ready to go when people search for food near them is a key to restaurant success in 2018. Learn how to set up your Google My Business page in Toast’s new 2018 Restaurant Marketing Plan Template. No restaurant marketing approach is more universal than charitable giving, event sponsorship, and community involvement. Unlike social media accounts – which not everyone has – everyone lives in a town or city and is part of at least one community, whether it be their town, their local school district, their office, a group with a common interest, or a combination of these. Thus, it should come as no surprise that 68 percent of restaurants engaged in some sort of charitable giving or event sponsorship in 2017, making it the second-most popular advertising method for restaurateurs this year. One example is working with local schools and organizations for a give back night. Give back nights occur when your restaurant agrees to sponsor a group in exchange for increased business. In the example above, Chili’s worked with a local high school sports team. 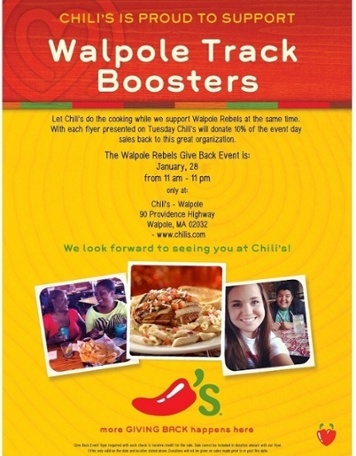 Members of the team distribute the flyers in school and around town, encouraging community members to visit Chili’s. Chili’s, in turn, donated 10 percent of the sales directly driven by the event back to the team. Both groups won – the team earned funds and the restaurant saw increased business. Sponsorship can earn your brand placement at sports games and concerts and can even gain media attention. The spectrum of restaurant sponsorship is so vast that almost everywhere you look there’s an opportunity to take. Click here to read more tips for marketing your restaurant in 2018.